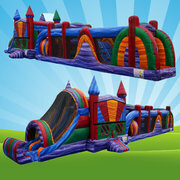 Obstacle Course Rentals | PartyHoppersTX.com Lake Houston TX. These exciting challenge courses are as much fun to watch as they are to participate in. 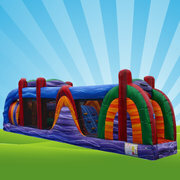 Great for school fun days, church groups, and all large events. The dual lanes allow for large numbers of players to get through the attraction, and your guests will have a great time watching as players crawl through tunnels, navigate obstacle, and take on the awesome climb to get to the slide. All of our inflatables are manufactured from "lead-free" vinyl, and are cleaned and sanitized after every rental for your child's and guest's safety. Browse the selections below and click on the image or "More Info" link to get additional information and to make a reservation.